In the past few months I have thought a lot about the expression, “as American as apple pie.” Whether I was tossing and turning in bed during many sleepless nights, driving past homes with the American flag and an occasional Confederate flag, whether I was standing at the stove until late at night canning and preserving the harvest from my garden, or angrily digging up the soil and pulling weeds until I almost dropped in an attempt to vent and get away from too much news intake – it all seemed to be boiling down to one question: What is American? American cannot be reduced to just apple pie. It’s also fried chicken and cornbread, guacamole, tacos, dim sum, samosas, falafel, kielbasa, pretzels and all the countless other foods that different ethnic and immigrant groups have brought to this country. Without that diversity, the foods we eat would be pretty dull. Yet appreciating diversity does not end on our plates, it only starts there. Recognizing that diversity is a fundamental American value, and that attitude determines everything else – how we identify ourselves, how we perceive those who are different, and, ultimately, America’s role in the world. In a bout of idealism and naïveté, I started Cooking-with-a-Hyphen last spring. Based on the idea that we are all hyphenated Americans, it is an attempt to bring people of different ethnic and political backgrounds together over potlucks to celebrate diversity in America. A few people have followed the idea and held potlucks as far away as Berlin, Germany, for American expats. The largest potluck so far with more than 100 attendees was last June in Allentown, Pennsylvania, organized by the progressive community organization Lehigh Valley for All. Last weekend, I co-organized a potluck in Schuylkill County, Pennsylvania, where I have lived for 16 of my almost 20 years in the United States. I had been sitting on the fence about a potluck here the entire summer. In a place where the population is more than 92% white, there is not much diversity, so what’s the point? Actually, there is a point. Just because this is an ethnically homogenous area, where most people don’t have neighbors or colleagues who are different, it does not mean that they don’t accept diversity and view themselves as part of a diverse America founded on equality. Around 30 people showed up for the potluck. That is a good turnout for an area where many people are insular. There was Polish stuffed cabbage, German bread and Lebanese mujaddara. There was a table with ACLU information materials. A new friend of mine, whom I met through the Women’s March in D.C., drove up from the Lehigh Valley (which is much more urban and diverse than our county) to sell her Hate Has No Home Here signs tailored to the most commonly spoken languages in northeast Pennsylvania. And even the local newspaper sent a photographer and reported about the potluck. People were engaged, mixing, mingling, and trading stories about family backgrounds and immigration. Several said they wanted to do another get-together like this next year. Sitting together around a table, talking and listening to others creates an environment that no social media will ever be able to replace. Nothing facilitates face-to-face communication better than sharing food. And that, by the way, applies to any place in America, regardless of how ethnically diverse or homogenous it is. 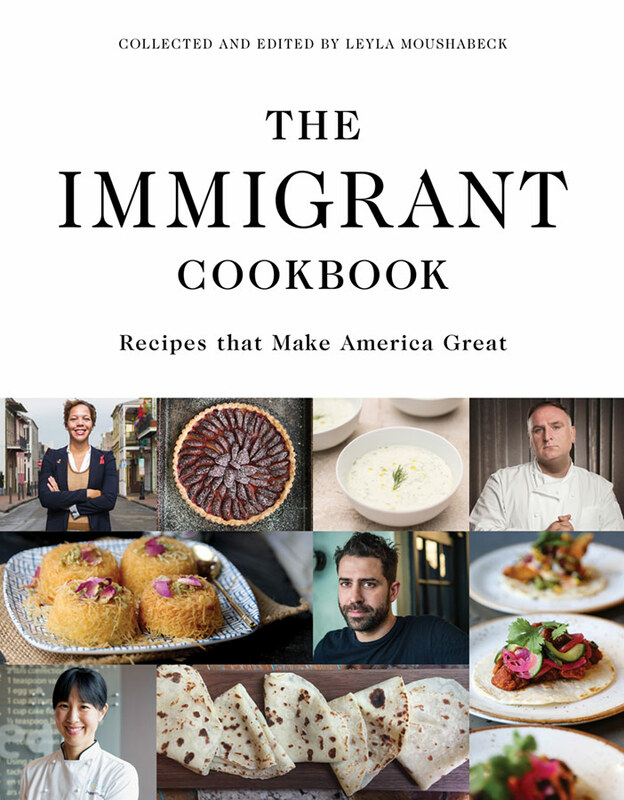 This is a fall variation of the Rhubarb Challah that I contributed to The Immigrant Cookbook: Recipes that Make America Great, which raises funds for the ACLU Immigrants’ Rights Project and which will be released in December. 1. For the apple filling, cut the apple into ½-inch (1.25cm) chunks. Place them in a heavy saucepan with 2 to 3 tablespoons water and the lemon juice. Cover and cook until the apples are soft but not falling apart, about 6 to 8 minutes. Stir often at the beginning to prevent it from sticking to the bottom of the pan. Dust with the flour and cook, stirring often, until it thickens, about 3 minutes. Remove from the heat and let cool. 2. Toast the walnuts in an ungreased pan until fragrant. Let cool, then chop coarsely. 3. Place the raisins in a heatproof bowl and cover with hot water. Let soak for a few minutes, then drain well. 4. In a bowl, mix apples, walnuts, raisins, honey, cinnamon and ginger and stir until thoroughly combined. 5. For the challah combine the yeast with the lukewarm water in a small bowl and let stand for 10 minutes, until frothy. 6. Mix the flour with the salt and sugar in a large bowl. Add the beaten egg, yeast mixture and oil. Knead into a smooth dough using the kneading attachment of an electric mixer. Cover and let stand for 2 hours in a warm place. 7. Knead the dough briefly on a floured surface to remove any air pockets. Place a large piece of parchment paper on the work surface and lightly dust it with flour. Roll the dough into a 10 x 15 inch rectangle. Lightly mark two lines lengthwise with the tip of a sharp knife to divide the rectangle into three sections of equal width. 8. Generously spread the filling onto the middle section of the dough, leaving 1 inch free on both short ends. Using a pastry wheel, make diagonal cuts in the right-side section of the dough at every ¾ inch. Cut the dough to within about ½ inch of the filling. Repeat this on the left section of the dough. 9. Starting at one end, gently lift a cut strip of dough and place it all the way over the filling, alternating a strip from the right section and the left section of the dough. Pinch both ends of the braid together to seal and tuck them under. Carefully transfer the parchment with the braid onto a baking sheet. Cover and let stand for 45 minutes in a warm place. 10. Preheat the oven to 350 degrees F (180 degrees C). Lightly beat the remaining egg with 2 teaspoons water. Just before baking, brush the braid with the egg wash and sprinkle it with pearl sugar. Bake in the preheated oven for 30 to 40 minutes, or until golden brown. Let cool completely on a wire rack before cutting. This is a combination of three foods I love : apple butter; Masala sugar, a sweet take on Indian spices; and German marzipan. I did not want to make this too sweet, so I did not add any sugar to the apple butter and reduced the amount of confectioners’ sugar I usually add to marzipan to a minimum. The apples for the apple butter need not be pretty; in fact, those fallen off the tree are the best. I made the apple butter in the oven to prevent the inevitable spluttering. If you want to make a smaller amount, the rule of thumb is 2 tablespoons Masala sugar and 1¾ ounce (50 g) marzipan per 1 cup unsweetened apple butter. ¾ cup (120 g) Masala sugar (a double batch, find the recipe here) 1. Cut the apples into chunks and place them in a Dutch oven with just enough water to cover the bottom of the pot. Slowly bring to a boil and cook, stirring often, until the apples are very soft and fall apart, about 15 minutes. 2. Preheat the oven to 300 degrees F (150 degrees C). 3. Puree the apples in the pot with a stick blender. Place the Dutch oven in the preheated oven. Adjust the oven rack as needed so the pot sits in the center of the oven. Cook, uncovered, until the consistency becomes very thick and a spoon leaves a trace, about 2 to 3 hours. The time depends how juicy your apples are. Stir and scrape down the sides every 30 to 40 minutes. 4. To make the marzipan, process the almonds in the food processor to a very fine powder. Add the confectioners’ sugar and process until a thick, smooth paste forms. Add water, 1 teaspoon at a time, if the paste is dry and crumbly. Frequently scrape down the sides of the food processor bowl to ensure that the entire paste is smooth. At the end, add a few drops almond extract and pulse to combine. 5. Measure the apple butter; you should have about 6 cups (1,4 kg). Add the marzipan and the Masala sugar and mix in a blender, large food processor or with a stick blender until evenly combined. 6. Fill the piping hot apple butter into sterilized jars placed on a damp kitchen towel, leaving about ½ inch (1.25 cm) headspace. Stir to remove any air pockets. Wipe the rims of the jars with a damp piece of paper towel to remove any drips. Place the lids and the bands on the jars and process in a boiling water bath for 10 minutes. This is off on another tangent, but if you are interested in learning about old apple varieties being rediscovered, look up ‘The Apple Detective” on your browser. The articles are pretty interesting and some of his discoveries are pretty amazing. You are referring to David Benscoter, right? Very interesting, thanks for the tip, Bettie. Reminds me of Isabella Dalla Ragione, an Italian agronomist, who hunts down lost fruit varieties, The New Yorker had a fascinating piece about it in 2005. I am not so interested in the recipe, but what you wrote about American culture was worth stopping by. I happen to be a native of the Santa Clara Valley, and a descendant of families who have been here longer than almost everyone else; but so much of what I learned about American culture I learned from those who came here from somewhere else. In a way, it might seem sad that we natives take it for granted, but that is okay. I grew up with several kids who were first generation American, and a whole bunch of kids who arrived here while quite young, as refugees from Vietnam. I will not get carried away and write a long essay here, but there is a lot to learn from those who were not as blessed as I was to be born American, and had to do do what they did to become American. We still celebrate Vietnamese culture here, but Vietnamese culture also adds a whole new level of admiration and appreciation to what American culture is. Your comments are spot on. It often takes an outsider for the insiders to appreciate what they take for granted. And good to hear that you grew up exposed to Vietnamese culture; if children grow up ethnically insular, it can be even harder to keep an open mind later in life. Ha! Did you even catch how similar those two statements are? Incidentally, many of my houseplants were landscape plants. Some from Southern California were houseplants here, just because they did not like the frost. Others were redwood, eucalypti, yucca and so on. As a native of California, and a descendant of natives who grew up mostly around natives, I learned about much of what is greatest about America from those who came here for something they lacked where they came from. I might otherwise take it for granted.